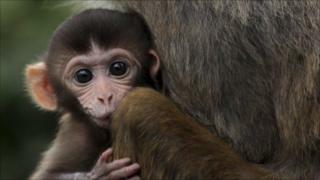 Baby monkeys grew up anxious and anti-social after the stress of separation from their mothers, a study says. It suggests changes to the brains of infant monkeys may be irreversible, and the study could be a model for humans. An early shock to the system may leave the monkeys prone to a life of anxiety, poor social skills and depression. But the work could point the way to better management and treatment of those who live with a legacy of "early adversity". The report, published this week in the journal Proceedings of the National Academy of Sciences, showed that rhesus monkey babies do not fully recover from the stress of being separated from their mothers at birth. Some baby monkeys had to be cared for separately if they were at risk from an inexperienced mother, the mother lacked breast milk or the baby would not survive in rainy, cold weather. But even after three years of living a normal social life following the separation, levels of the stress-coping hormone cortisol in these monkeys remained significantly reduced and their bodies' response to stressful events was slower. In monkeys and humans, cortisol is released in stressful situations to mobilise energy stores and aid survival. But sustained stress and prolonged release of cortisol can lead to severe impairment of some brain regions as they develop. The baby monkeys that suffered the stress of separation from their mothers went on to be more anxious and less sociable than monkeys that were raised by their mothers. This study is unique in demonstrating that, for monkeys, the negative effects of separation in infancy cannot be reversed by a later normal social life, write the authors. These findings may help explain work reported earlier this week in the American Journal of Psychiatry (AJP) on the link between childhood maltreatment and later depression in humans. Both of these studies suggest that stress on infants has long-term negative effects. Dr Andrea Danese of King's College London, co-author of AJP study, said: "In this case you have findings in animals that resemble to an extent the findings in humans both from a behavioural point of view and from a biological point of view." "If you take studies in humans who have experienced loss I think the findings are quite consistent. Children who lose parents or are separated from parents tend to show more anxious behaviour, and tend also to have changes in the same type of hormones that were measured. In some cases they have poorer social skills, they have more aggressive behaviour." In humans, there also appear to be links between childhood adversity, physiology and other illnesses later in life, possibly through the stress-sensitive immune system. Dr Danese told BBC News: "Both cortisol and the immune system are related. Cortisol is a very potent anti-inflammatory compound: low cortisol means high inflammation." "Adults with a history of childhood maltreatment have these elevated inflammation levels. Inflammation is one of the key factors that contribute to a number of age-related conditions like cardiovascular disease, type-2 diabetes and dementia." "There is something in these stress sensitive systems that is very finely regulated and tuned in childhood. This is because all these systems are developing and maturing during early life." It appears that stress in childhood, for monkeys and humans, can lead to behavioural and health problems that can only be partially repaired in later life. But there is a positive side to these results. "The message sounds very negative and I understand why, but from the research point of view I think it is positive because it points to the problem and once we understand the causes of all these behavioural problems, we can then start trying to find the potential cures," said Dr Danese. He added: "In humans, there is a movement in psychiatry to be moved earlier in life. More and more we're trying to work with young people who have been exposed to traumatic experiences, to maltreatment, to try to see how we can help them overcome their depressive symptoms or work with families and try to avoid the recurrence of the traumatic event."